Happy Bunny And The Magic Rock! So it’s been a busy month with the SF Zine Fest and Alternative Press Expo and personally I’ve run the gamut financially, professionally and personally. What I’m trying to say, is that there has been numerous extenuating circumstances that have lead to my admittedly god awful updating record with this blog. Or maybe I’m just really bad at this whole web comic thing. That’s always been a possibility. Anyways, we’ve been cranking out new comix like usual, and I wanted to share this little jam that I was especially proud of. Audrey started this one out with one of her adorable bunnies taking a light hearted little romp through the forest or some kind of meadow or something. 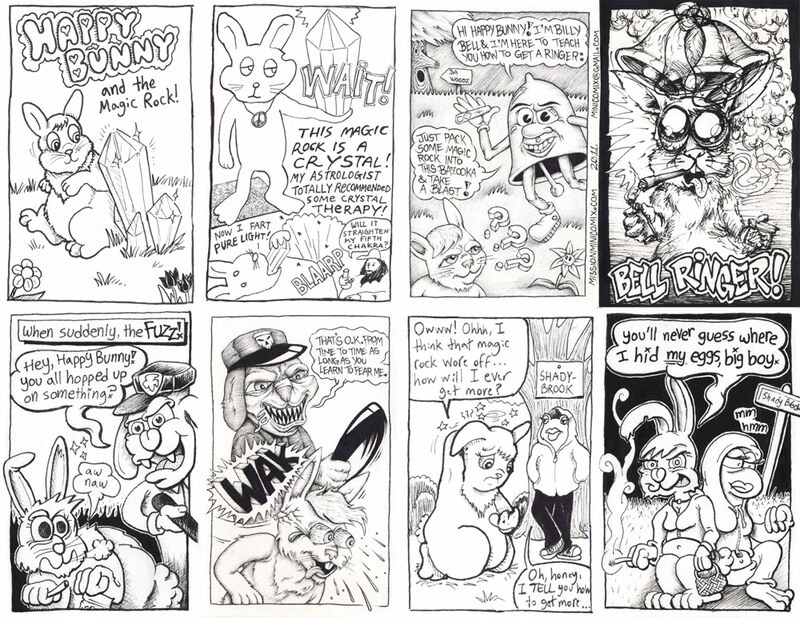 However, it was her inclusion of Happy Bunny stumbling across a magic rock with a suspiciously crystalline composition that I think really took this comic off in a darker direction. I think Audrey even mentioned that she didn’t want this comic going anywhere illicit, and Antonio made a valiant attempt to direct the focus of the comic towards the healing power of crystals, but the rest of the mini comic was inexorably drawn in to a slightly more narcotic interpretation. I then capped it off by drawing some happy animal prostitutes. There was a little discussion about whether Happy Bunny was a boy or a girl preceding the last panel, but I think the comic works equally well whether you think Happy Bunny was a girl the whole time or whether he made the switch later on. What ever helps you sleep at night, kid. Mikey: Yes we can all agree that Mantonio’s panel is the odd-man out here, but s’all good. It’s even got Thom in there smoking a bong load. I’d say the panel doesn’t detract from the mini and that’s the important thing. I did then go and mercilessly start the process by which little creatures of the forest get turned out. The little sign saying “da woodz” was actually a reference to Woodward way, off of 14th and Mission, which was helluv cutty a few years back, and though still shady isn’t quite as shady. 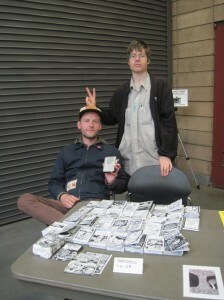 This comic was one of those minis that wrote itself. I would like to do a follow up mini. Spencer’s panel was the money shot. Little rabbit catching a ringer. Classic. Anthropomorphic forest animals and crack: what’s not to like? Makes me reminisce about a time when cartoons had cartoon animals doing all sorts of things, a golden era of innocence long since past in the animated and drawn cartoon worlds. Where’s the slapstick, the pathos? The cover and 7th panels were drawn by Audrey, the 2nd panel was drawn by Antonio, the 3rd and 6th panels were drawn by Mike, the 4th panel was drawn by Spencer, and the 5th and last panels were drawn by Rio. 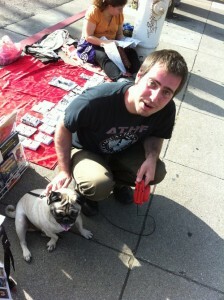 Here’s some bonus pictures of Mike and Nick at SF Zine fest and me and Audrey with Jeff’s pug at APE.